Established in 1949 with $7,200 in seed money donated by an all-women’s charity group, the Arts Council of Winston-Salem in North Carolina became the first arts council in the United States and has served as a model for the more than 4,000 arts councils that exist across the country today. The arts council movement was sparked by the need for a representative organization that could serve as a leader for the collective arts interests of a community. From raising awareness of the value of the arts and preserving local culture and artistic traditions to establishing funding and other types of resources that enable area artists and organizations to thrive, an arts council becomes the collective “voice” for the arts in their surrounding neighborhoods. No two arts councils or communities are alike, nor should they be—and the relationship between area arts councils and the creative community becomes synergistic. A successful arts council strives to respond to the creative needs that are unique to their community, and in turn, the artists and arts organizations are able to flourish with their support. What is common to all is a desire to spark cultural growth by promoting and coordinating the arts at a grassroots level—and most important, making arts experiences accessible to everyone in the community. Central Ohio, just like any region, needs large institutions to set standards and serve as cultural anchors. But people also want arts experiences that are close to home and part of their daily lives. There are more than a dozen suburbs that surround the city of Columbus and the arts are an important part of the vitality of these neighborhoods. As Central Ohio continues to grow, more suburban communities are taking steps to build and put a spotlight on their unique identities and offerings—which can only make our entire region stronger. GCAC recently spoke with several representatives of surrounding suburban arts councils and arts centers about their own special ways of approaching their mission—from fun social events and live concerts, to partnering with local schools and exhibitions powerful enough to change a person’s perspective. We asked them to share some stories that reflect the artful impact they are making on their communities. Mission: To encourage participation in and appreciation of the arts in the Westerville area. The Art Council of Westerville (ACW) strives not only to promote the arts in the Westerville area, but also to make arts experiences accessible to the community. The arts connect a community, generating discussions and ideas that improve the overall quality of life. Actually creating artwork is a personal experience and fosters a greater appreciation of the various forms of art. About a year ago, ACW partnered with a local wine shop, Meza, to offer a program called Sip and Sketch, which takes art lessons to a fun new level. Individuals, friends and couples of all artistic skill levels gather and create unique art pieces, while tasting a flight of five different wines. Some people are intimidated by the idea of trying to create a work of art and the relaxed and fun environment allows participants to let go of some of their inhibitions. Many are frequently surprised by the creativity that they are able to tap into and are proud of the results at the end of the class. Although the name suggests that the class concentrates on sketching and drawing, the art medium varies—from collages, to pastels and watercolors. Most of the instructors who lead the classes are current art teachers, and many give private art lessons. Sip and Sketch has been very popular. Many participants find the classes to be therapeutic—a relaxing way to explore a new means of expression. The program has also offered a great opportunity to socialize with friends and meet new people. It is also beneficial for the instructors, providing them with a list of potential new students. Sip and Sketch is held the first Tuesday of each month at Meza Wine Shop, 48 N. State St. in Westerville. For more information, call (614) 259-3101. Image courtesy of ACW. Mission: To provide and promote a diverse, lively, accessible arts environment that advances the cultural assets and enriches the quality of life of the community. To accomplish its mission, the City of Upper Arlington Cultural Arts Division (UA) offers a variety of programs in different disciplines designed to get the community engaged with the arts. 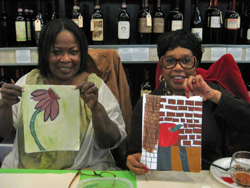 Offering exciting and engaging arts activities enriches the experience of those who participate in their programming. Time and again, UA has witnessed the success of their programs with community members who’ve participated often returning to events and bringing their neighbors and even members of other communities to share in the experience. UA is able to offer a wide variety of program offerings that engage people of all ages and diverse backgrounds from their community. UA’s Music in the Parks summer concerts has attracted residents from First Community Village, a local retirement community. It's a wonderful opportunity for these older folks to interact with the larger community and enjoy an evening of free music. At the annual Labor Day Arts Festival, an interactive mandala project brought grateful acknowledgement from the Indian population in Upper Arlington. One family remarked how grateful they were to see an aspect of their culture represented. Staff and volunteers for UA’s events make every effort to welcome visitors and to encourage their participation and feedback. With feedback from audiences as well as artists who participate in programs, UA is able to improve their experiences; which in turn deepens their appreciation and strengthens the public value of the arts. The artists from UA’s programs have also given us great feedback. An emerging artist who performed in the Music in the Parks series expressed gratitude for the experience and UA’s support of “young musicians like me who are just starting out." From a local poet who offers poems near her home along the pathway at Sunny 95 Park: "I'm just trying to make a small difference in my corner of the world. Thank you for noticing. My husband and I appreciate the work of the commission and value all the rich artistic offerings you bring to Upper Arlington. It's one of the reasons we love living here so much." Mission: To engage the community, cultivated creativity and foster life-long learning through the arts. A mother burst into tears as she discovered the image of a teenager with arms crossed, wearing ear buds and a defiant attitude. A youngster stood transfixed, staring thoughtfully at a photograph of a young woman working at a desktop computer, imagining whether or not his sibling may have a similar job someday. Co-workers burst into giggles as they experienced the impact of a floor-to-ceiling collage of faces; while a new grandfather quietly sobbed as he watched a film depicting everyday interactions of young adult roommates. This wasn’t ‘just’ a photography exhibition. It was Shifting Perspectives—a U.S. debut that Dublin Arts Council was privileged to host in 2011. 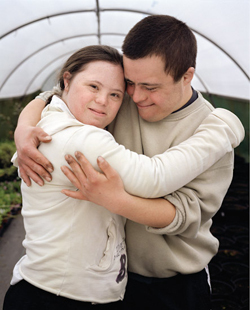 The exhibition offered a poignant, yet hopeful view of individuals living with Down syndrome. The emotional responses to the exhibition were unprecedented. Some related directly to the people depicted in the images, particularly families who were related to someone living with Down syndrome, seeing that parents in other countries have the same feelings and hopes for their children. Others were touched at seeing images of the daily lives of people living with Down syndrome—and realizing that living with DS does not have to mean suffering or that their lives are any less normal. Others were simply moved by the ability of photography to evoke such emotion by telling stories and even acting as a vector for social change. The artwork clearly had the ability to challenge perceptions, while offering healing and hope to those who experienced it. Dublin Arts Council is a thriving nonprofit community arts organization that has developed the nationally recognized Dublin Art in Public Places program which has grown from one sculpture in 1990 to more than 70 sculptural elements today. Dublin Arts Council presents the annual DAC Sundays at Scioto summer concert series, now in its 29th year. DAC hosts a year-long Visual Arts Series of exhibitions in its gallery, offers classes, camps and workshops for all ages and further supports local creativity by awarding grants to community arts organizations. Image: a young couple featured in the Shifting Perspectives exhibition. Courtesy of DAC. Mission: To enhance the cultural and economic vitality of our city by inspiring, enlivening and educating our citizens through the arts. The Hilliard Arts Council is proud to sponsor a wide variety of arts activities in their community. HAC produces a number of plays and musicals, sponsors a community band and a community orchestra, and offers a summer drama camp for children. HAC also sponsors an art fair featuring visual artists from the central Ohio area and brings in a diverse range of entertainers to perform for Hilliard residents. But the one event that stands out as the “crown jewel” for HAC and the community is their summer musical—the arts council’s longest tradition. HAC has produced 29 summer musicals since 1976 including such classics as The King and I, Fiddler on the Roof, Carousel and Oliver. They’ve also produced contemporary musicals such as Evita, Jekyll and Hyde and, most recently, HAC was the first community theatre in the Columbus area to present Ragtime. HAC’s casts are made up of graduates of Hilliard schools, many of whom have gone on to become theatre professionals. Members of the Hilliard community and actors from the greater Columbus area also participate in the productions; many enjoy the experience so much that they return summer after summer. One of the special aspects of HAC’s musicals is that they have often involved multiple members of the same family. On more than one occasion, their productions have featured an entire family—both parents and all of the children. Some have included three generations from the same family! Through a great partnership, Hilliard City Schools allows HAC to use their theater at a very reasonable cost. In return, students have the opportunity to participate either on stage or back stage. 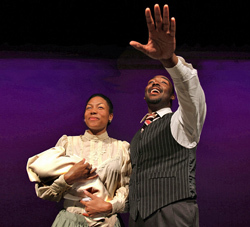 Image: Scene from the musical production of Ragtime. Courtesy of HAC. Mission: To inspire and enrich the lives of the residents of New Albany and surrounding communities and to foster an appreciation of the arts and culture by providing lifelong learning opportunities through education, exposure and participation. The Jeanne B. McCoy Community Center for the Arts in New Albany is a young and growing organization that opened in February 2008. A unique partnership among the New Albany Community Foundation, New Albany Plain Local Schools, the City of New Albany, and Plain Township enabled the construction of the McCoy Center. The school system uses the theater 60% of the available time, and the McCoy Center board and staff facilitate several organizations’ presentations in the beautiful, state of the art theater including the New Albany Symphony Orchestra and New Albany Ballet. The broad base of support that made the performing arts center a reality continues to be evident with six of seven McCoy Center presented shows selling out in the 2011-2012 season. Education and collaboration are central to the vision for the McCoy Center. In this past season, a collaboration with the King Arts Complex encouraged many McCoy Center patrons to explore the King Arts Complex and enjoy a performance by the a cappella vocal ensemble, Committed. A few weeks later, King Arts Complex patrons experienced the Dance Theater of Harlem at the McCoy Center. It was a wonderful collaboration, introducing each organization’s patrons to a new venue with incredible performances at each. Offering arts experiences for all ages, a younger McCoy Center audience enjoyed another local collaboration with Columbus Children’s Theatre. CCT’s Aladdin was a very accessible and interactive performance, with everyone on stage with the actors and the children sitting ‘criss-cross, apple sauce’ in the front rows. A critical step in audience development is providing meaningful interaction between artists and audience members. Following the performance, all enjoyed an ice cream social together. The community partnership that built the McCoy Center, collaborations, interaction with artists of all genres, and solid community support are hallmarks of this new center. Those facets of the McCoy Center’s mission will be front and center as the organization continues to grow and mature. Mission: To serve as an advocate for a stronger cultural community, develop and support visual and performing arts, and provide classes and workshops for all ages. In 1999, the New Albany schools offered little in the way of performance art programs. There was a small high school choir, the elementary did a once a year Shakespeare workshop, and there were music classes in middle school. The high school theater program was limited to plays and never really attempted musical theater due to inadequate facilities, lack of funding and limited participation. There was no theater program at all in the middle school. New Albany High School’s music director, Karrie Horton, and the Arts Council teamed up to start a summer musical theater program for primarily middle school age kids. The goal was simple: provide an intensive five- to six-week daily workshop that would pique the student’s interest enough that they might continue on to high school music and/or theater programs. They weren’t looking to make stage-performing “stars.” They knew the arts made better students and better, well-rounded individuals, and that was good enough. NAAC put on their first production, Guys and Dolls Jr., in 2000. The first few years of the program, they had to practically beg kids to participate to have enough to fill the roles. Now they have so many who audition from the Central Ohio area that they have to turn some away—the only regrettable side effect of a successful program. NAAC now stages three to four performances during the second weekend in July at the McCoy Community Center for the Arts to nearly sold-out crowds. The positive impact that the Arts Council's theatre programming has had on young people who have participated is obvious. New Albany area high schools now boast several choirs for all levels of talent, as well as a designated theater director in Elliott Lemberg--because theater has become a “demand” and not a luxury to these kids. Many of the young people who participate in the programming go on to college and major or minor in theater, and many of them come back to assist with the productions. Some are going into theater as a profession. All of them received valuable life lessons because of this program which will help them in whatever their chosen field might be. NAAC is now in rehearsal for a production of Rodgers and Hammerstein’s State Fair that will take place July 13, 14 and 15 with a stage manager and choreographer who are both veterans of NAAC’s programs. In addition to the music and theatre programming, the NAAC also offers workshops, a summer arts camp and an annual Harvest Festival for the community. Mission: To change lives and make memories through creative arts experiences. The MAC is an arts center, first and foremost; a place where people can gather for experiences that spark learning and build creative conversations. It is a place where artists can create, people can explore creative opportunities and be entertained, and groups of individuals of all ages can laugh, sing, dance, read, paint or just imagine possibilities. Successful communities offer a broad spectrum of life experiences for residences—recreation, education, health and welfare. Worthington is certainly rich in all those areas. The MAC certainly doesn’t stand alone in blazing the trail for bringing people together in Worthington. Draw back the lace curtains on the New England inspired streets and meet the many creative residents who have chosen to make this bedroom community their home. There are nationally recognized painters and performers, architects, gallery owners, speakers, animators and writers who have chosen this community as their home. The creative culture is alive and well even in suburbia. The McConnell Arts Center has found its niche as home to such dynamic arts related groups as Central Ohio Plein Air, Central Ohio Watercolor Society, Worthington Community Theater, Worthington Area Art League, Ohio Fingerstyle Guitar Club, Worthington Writers Group and the Worthington Song Writers. A roof overhead for more than 600 creative souls called artists. Because of those creative connections in our own community the MAC has seen an average of 40% increase in attendance each year since opening in 2009. The financial impact and new dollars those audiences have shared equates to more than 1.6 million. More than 65% of audiences come from outside the Worthington area, inviting the growth of the MAC community to spread beyond geographical boundaries. The MAC serves as a catalyst for arts to happen—offering a community space to meet for performances, exhibitions, workshops, or just for fun. The Greater Columbus Arts Council is committed to helping our regional and suburban arts councils and centers reach new audiences and share best practices. To this end we have been convening quarterly meetings of these organizations for the past two years. We share GCAC cooperative marketing opportunities with them and they help us, and each other, learn more about their accessible and innovative programming--successes as well as challenges. To learn more about programming offered by the organizations featured here please visit their websites. The most comprehensive national resource for local community arts councils is Americans for the Arts (www.americansforthearts.org). Founded in 1960, Americans for the Arts is the nation's leading nonprofit organization for advancing the arts and arts education. With over 150,000 members and stakeholders they are dedicated to representing and serving local communities and to creating opportunities for every American to participate in and appreciate all forms of the arts. Doo Dah Parade, courtesy of columbuser.com. Proposed mural for Glen Echo Ravine, courtey of ColumbusUnderground.com.